Craig Baudendistel is an instructor in the Department of Mechanical and Materials Engineering. Getting certified in 3D modeling software widely used in industry is available for the first time to students in a class in the Wright State University College of Engineering and Computer Science. Students taking Engineering Design and Solid Modeling taught by Craig Baudendistel, instructor in the Department of Mechanical and Materials Engineering, can now opt to take an exam that could certify them in SolidWorks free of charge. SolidWorks is a solid modeling computer-aided design and computer-aided engineering program that runs on Microsoft Windows. It was developed by a graduate of the Massachusetts Institute of Technology and designed to be affordable, easy to use and available on the Windows desktop. 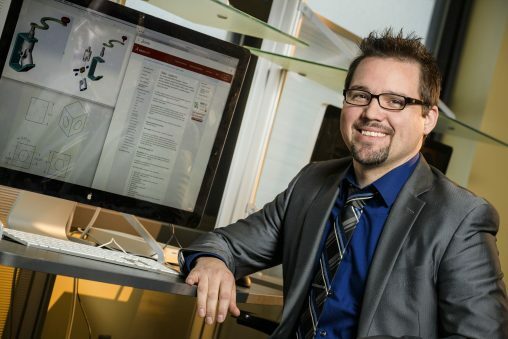 Baudendistel believes that having an official SolidWorks certification when they graduate from Wright State will make job-seeking students more competitive. “It may give your resume a little more weight than somebody else who may not have that certification,” said Baudendistel. Before 3D modeling was available, students would have to use a pencil and ruler to sketch out their designs, then take them to a machinist to extrude or build 3D parts. “Now, you start with 3D shapes and with the click of a button you have 2D drawings ready to hand to a machinist,” said Baudendistel. Wright State has offered classes in 3D modeling for more than 15 years. But if students wanted to become certified in SolidWorks, they had to do it through an employer and usually pay a fee for the exam. There is no charge for the exam if students take it through the Wright State class. And those who pass the exam will have the certification in their pockets when they go looking for a job. Baudendistel was able to obtain an educator certification, which allows him to offer the SolidWorks certifying exam in his class. Baudendistel hopes that as many as 50 students take the SolidWorks certifying exam this semester.